[SatNews] Two Boeing [NYSE: BA] 702SP (small platform) satellites, the first all-electric propulsion satellites to launch, have sent initial signals from space, marking the first step toward ABS, based in Bermuda, and Eutelsat, based in Paris, being able to provide enhanced communication services to their customers. Artistic rendition of Boeing's 702SP satellite. Additionally, the satellites were launched as a conjoined stack on a single SpaceX Falcon 9 rocket, demonstrating a patented Boeing technology that promises to noticeably reduce launch costs. “By launching the satellites as a pair, Boeing customers can save on launch costs while benefiting from the company’s highly capable and flexible platforms to meet their mission requirements,” said Mark Spiwak, president, Boeing Satellite Systems International, Inc. The program is an example of Boeing rapidly bringing innovative technology to market, moving the 702SP from development to signal acquisition in fewer than three years. 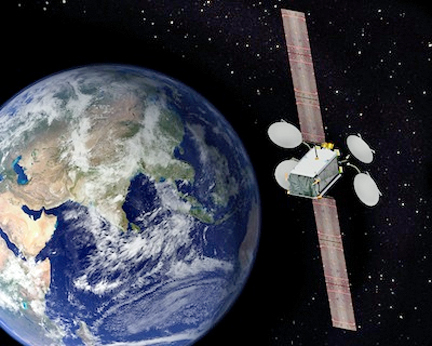 Once handed over, ABS-3A will expand ABS’ services in the Atlantic, Pacific and Indian Ocean regions. EUTELSAT 115 West B will principally serve rapidly expanding data markets in Latin America, as well as Canada and Alaska.